If you decide to paint your Garaga door yourself, the following instructions outline how to do it. It is important to note that oil-based paint (alkaloid) with a mat or semi-gloss finish no longer exists on the market (unless an industrial paint is used). It is recommended that mat or semi‑gloss latex (water‑based) paint is used to avoid highlighting imperfections in the metal. Use a synthetic (nylon/polyester) bristle brush to contour the raised panel, and a 4" (10 cm) roller to provide a nice finish. 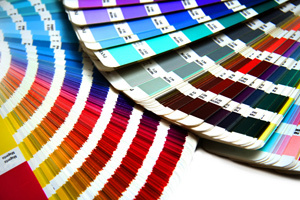 Paint stores that carry any of the major brands such as Benjamin Moore, Sico, Sherwin‑Williams, and Betonel/Dulux are normally equipped with a color measurement instrument to find the color formula. To repaint your Garaga door, just bring a sample of the color you would like to match. By sample, this could be a piece of PVC/vinyl, aluminum or fiber cement siding or even something simple like the color strips from the leading companies. The steps to follow remain the same for whatever brand of paint. However, before painting any Garaga garage door, we suggest you read our document about the Limited lifetime warranty. Wash the surface of each section with trisodium phosphate (ex. : Polyprep 771‑137) to remove any grease and oil residue as well as chalking. Rinse completely with clear water and let dry. Roughen the surface of each section with 220‑grit sandpaper in order to create an adhesive surface. Avoid using steel wool. Remove dust with a tack cloth or a vacuum. A primer coat is necessary only if the enamel is taken off and the steel is visible or if there is some rust. In these particular cases, apply a coat of zinc phosphate primer: SICO Corrostop Light Beige 635‑260 or Red Oxide 635‑785 or Benjamin Moore primer series 163. Let it dry a minimum of 16 hours before painting. Apply two finish coats of latex paint in the color of your choice. Before painting, PVC surfaces must be prepared and cleaned of dirt, oil, chalk and /or mildew with a diluted solution of trisodium phosphate, as with the steel portions. Consult product manufacturer instructions. Rinse completely with clear water and allow to dry. Apply a high‑quality paint such as a 100% acrylic latex exterior house paint. WARNING: dark colors absorb radiant heat from the sun creating extremely high surface temperatures. DO NOT PAINT the raised PVC overlays on the door using paint with a light reflectance value of lower than 56.